Re-posted from original blog on Unite US. Post-Traumatic Stress Disorder is more than just an illness. PTSD fundamentally affects individuals’ abilities to interact with others, perform basic tasks, and carry on with their daily lives. PTSD is a mental illness, but it can have lasting social, as well as psychological, consequences. Traditional symptoms like flashbacks, frightening thoughts, tenseness, and insomnia can be compounded by numerous other stressors – personal, financial, legal; the list goes on. We’ve seen this reflected by the many co-occurring needs of individuals with PTSD in our networks and greatly appreciate the efforts health and community systems are making to understand this complex disorder and its implications. Did you know that anyone can develop PTSD at any age, and that not everyone who develops PTSD has been through a dangerous event? Everyone’s experience with the disorder is unique. In an effort to reduce the stigma around PTSD and other mental illnesses, we want to ignite a conversation about proper identification, prevention, and understanding of symptoms and how to alleviate them. We also want to highlight the tremendous impact of community in successful PTSD treatment. To gain more insight, we talked to Kevin Rumley, Veteran Purple Heart and coordinator of the Buncombe County Veterans Treatment Court, and Nicole French, Psy.D., Veteran and Clinical Director at Veterans Bridge Home. Both of them emphasized the importance of recognizing and understanding the spectrum of symptoms. “PTSD affects the mind, body, and relationships,” Nicole says. “There is no silver bullet approach. 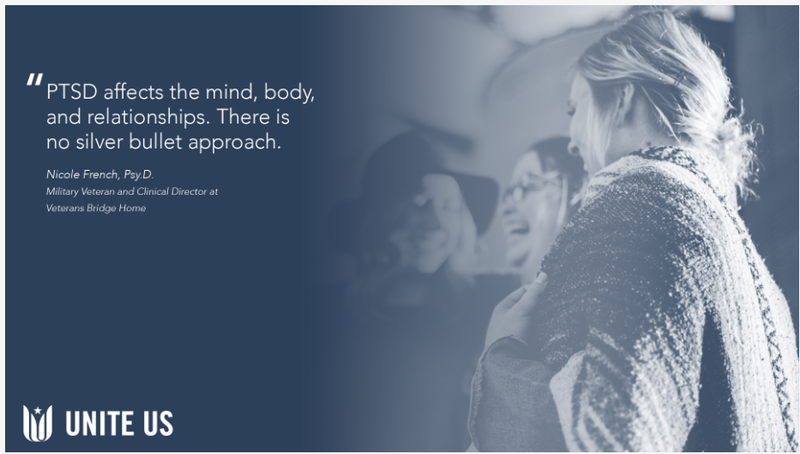 Individuals who are healing describe having a diverse community of support, a variety of supports from different organizations and/or people available to them, and prioritizing activities on a daily basis that promote healthy mind and body connection.” Both small and large-scale community support is a critical piece of the healing and prevention processes. We want to spread awareness about the impact of holistic healing and encourage you to get informed about the resources available and how you can play a role. Both Kevin and Nicole’s approaches to this topic suggest that to alleviate PTSD symptoms, there is great value in addressing those transitional challenges and social deficiencies that are compounding the disorder, or at the very least recognizing those who may be at a higher risk. As a society, we still have a lot to learn about PTSD. You shouldn’t wait until you know someone suffering from the illness to get informed (and chances are, you do). About 7 in every 100 people have been diagnosed with PTSD at some point in their lives, making it a more common diagnosis than generalized anxiety or bipolar disorder (Harvard Medical School). Kevin says that “once we begin to see that we can all play an active role in supporting our fellow veterans by listening to their suffering, we can begin to mitigate the challenges facing [their] community.” You don’t have to be a licensed therapist to be cognizant of those with anxiety disorders and support them in your network. For those interested in learning more about complex trauma and adverse childhood experiences, Nicole recommends the documentary Resilience: The Biology of Stress and the Science of Hope (which can be found here). PTSD awareness is also critical in professional settings, and many health systems still need to learn how to appropriately address the specific needs of veterans with PTSD. You never know where an individual with PTSD may show up and the role you may play in their treatment or recovery process. 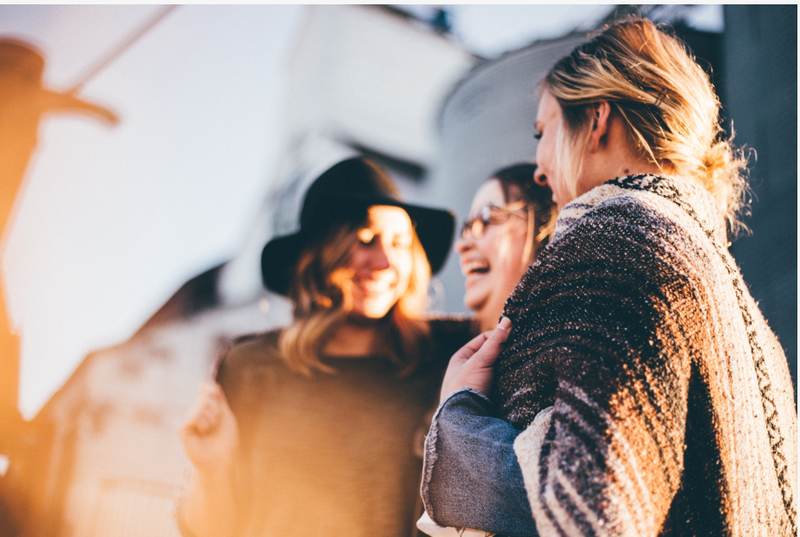 Encouraging our friends, coworkers, and relatives to seek treatment when needed – and reassuring them that it’s a courageous thing to do – is one of the best ways to help. There are a wide variety of PTSD treatment options available today that are constantly being improved in order to adequately meet the individualized needs of every individual, since no one’s experience with this disorder is exactly the same. However, effective treatment usually requires care from multiple angles. PTSD should be medically addressed, but successful long-term outcomes typically involve a more holistic plan involving the individual’s other co-occurring needs that may be compounding the effects of the disorder. This is where communities must step in, whether it be in the form of organizations or simply a network of caring friends. A huge thank you to both Nicole and Kevin for their honest and moving words. To learn more about Nicole’s work, visit www.veteransbridgehome.org. 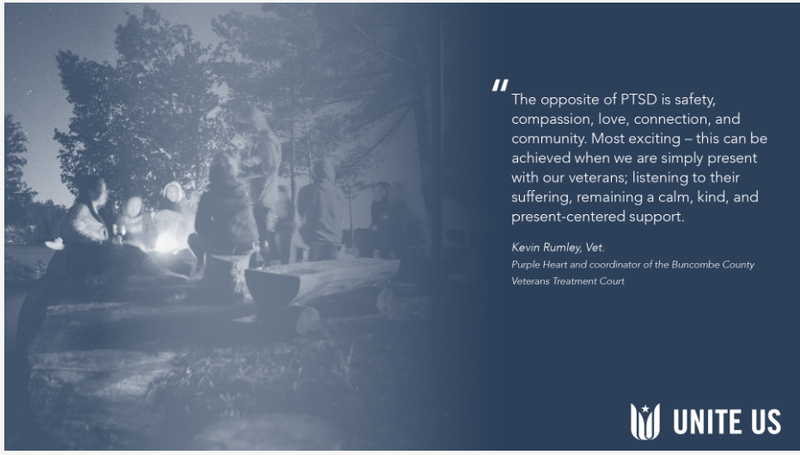 To learn more about Kevin’s work, visit www.buncombeveteranscourt.com.